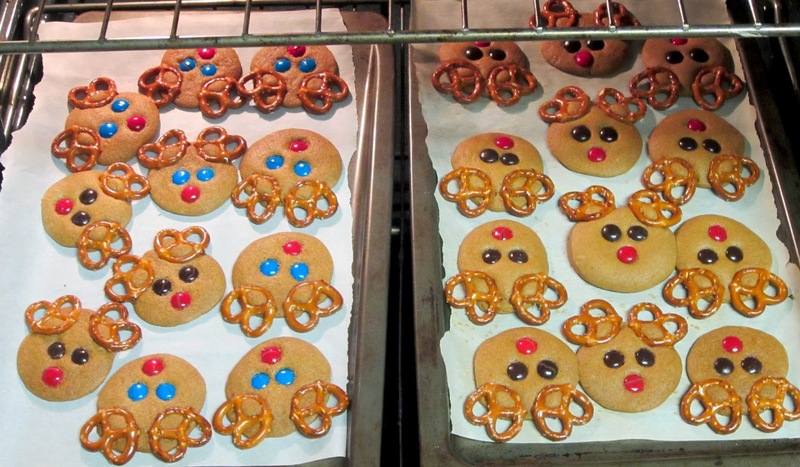 F&B and I are busy getting ready for Christmas, and that means baking! Since we spend Christmas with my parents, I usually make a few favorites to bring along, as my mom makes me my favorite cookies. My standard recipes to bring? Peanut butter blossoms, zebra nibbles, and of course, gingerbread reindeer. The gingerbread reindeer have long been a favorite for F&B, and they couldn't be easier to make. 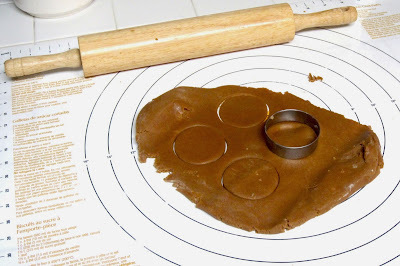 Some years, I do make my own gingerbread dough, but being pressed for time this year? I bought Pillsbury gingerbread dough. It's just as yummy and cut down several steps in the process. 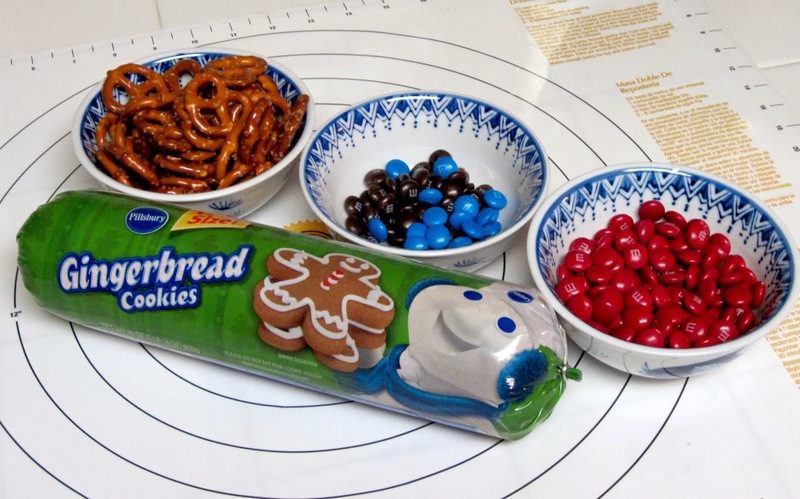 Either way, you'll need gingerbread dough, mini pretzel twists, and M&Ms. I usually put F&B to work sorting the M&Ms by colors, as we need the green ones for the zebra nibbles and the yellow and orange are the snack M&Ms during this project. We use the reds for reindeer noses and the blues and browns for eyes. What to do? Flour your dough, your hands and your mat, then roll out the dough and cut circles from it. I use a round cutter that is slightly under 2 inches in diameter. These cookies do spread out a bit, so cut them smaller than you want them to turn out. 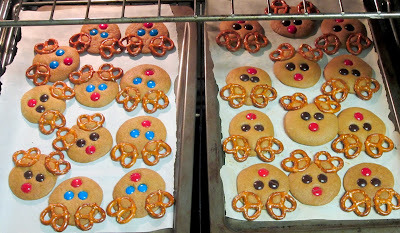 Press two pretzel twists into the top for the antlers, then add a red nose and two eyes (we like brown or blue). 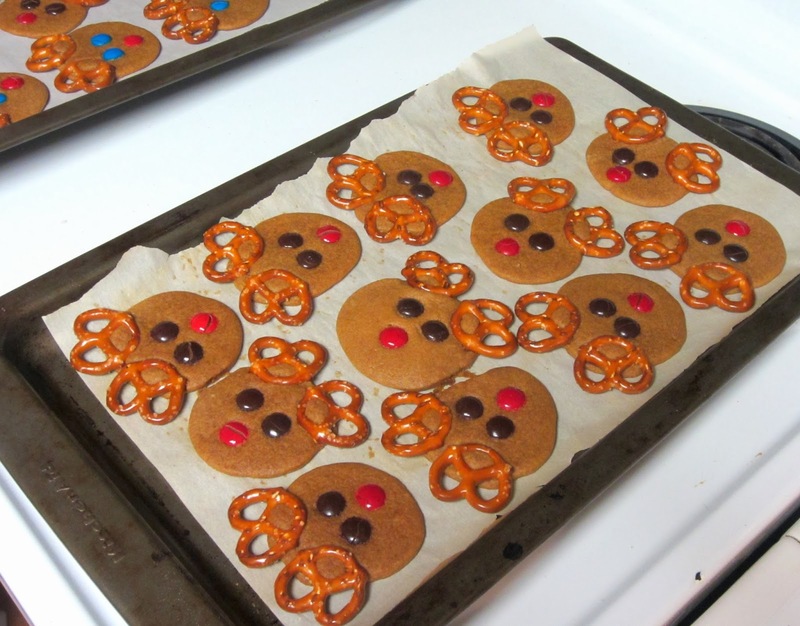 Bake per the package or recipe directions and you have gingerbread reindeer! The Pillsbury dough I used this year? We ended up with 5 dozen reindeer.